Pinterest is a great site to look for almost any image you want to see. But it is very easy to allow yourself to get lost inside the many images you might find. Yesterday, while I was pulled away from getting any work done, I found a new quote that made me smile. 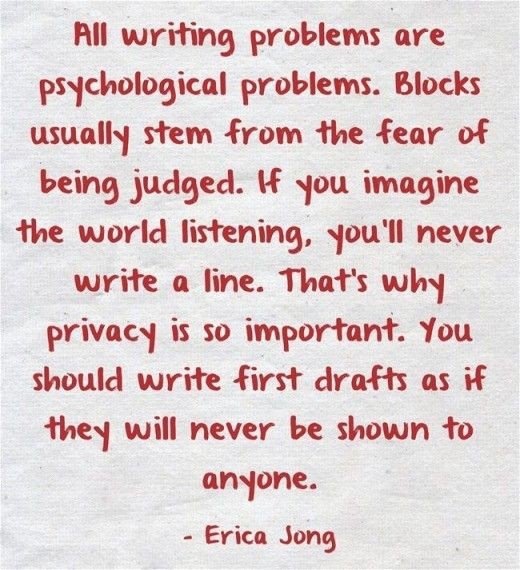 After I read Erica Jong’s quote I thought about the writing blocks I constantly find myself taking on. The main reason I freeze while writing my stories is the huge fear readers won’t like what I write. But let’s be honest, an author can’t make everyone happy every book. We like to think we love every novel our favorite author has written. But, if we were to be honest with ourselves, there is at least one book they wrote that we could live without. (I suppose, there are exceptions). Even with a book or two on our “could have been better” list we still love the author. That one bad story won’t eliminate the excitement we hold when we are told the great author will release a new book. In fact, we are even more excited for the next book because we hold high hopes the new story will be as great as their old ones. A great author can hold their readers’ love even with a questionable book published under their name. As long as you write what you feel is right then that’s all that matters. People are always going to have their opinions on your work and it takes a big person to move on and except what is said. Opinions should be used to build you up, not take you down. Don’t let your own doubt hold you back! Write on! How often do you get stuck completing tasks because you’re too worried about what others will think?